Please join me for a cup of Vanilla Chai Tea and a Tiny Pecan Muffin. The beautiful hydrangeas were gifted to me from my youngest daughter-in-law. Aren't they pretty? I have them in my teakettle that my son, Mike painted for me. The plaid plate is from Pier 1. The pretty framed picture is from Jenna from The Painted Apron , that she painted and made into note cards. I just love it! 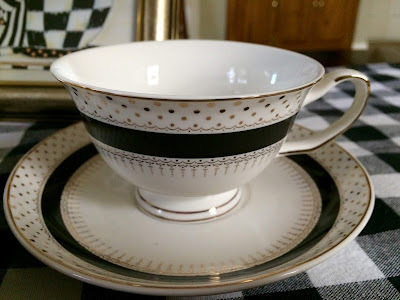 My teacup is from Grace's teaware, and found at HomeGoods. 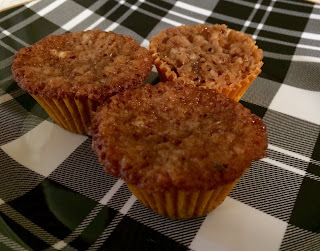 Cissy chose that we make the Tiny Pecan Muffins this week, when I told her that they taste like pecan pie. 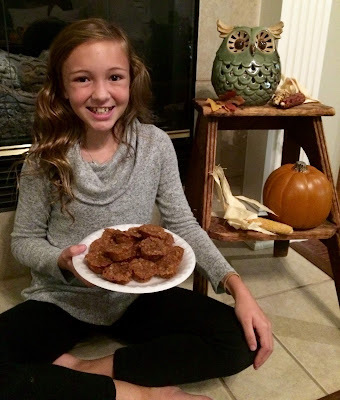 Pecan Pie is her favorite (mine, too!). These little gems taste like pecan pie, and are perfect bite-sized morsels. Bake in greased (I used Baker's Joy) miniature muffin tins @ 350 degrees for 15 minutes. Do not bake longer than 15 minutes. You can line the muffin tins with mini paper liners, but be sure to spray the liner. My muffin tin is nonstick and the muffins came out just fine. My son, Mike, created this pumpkin on my piggy blackboard for Fall. My grandson, Connor, turned 18 this past week! 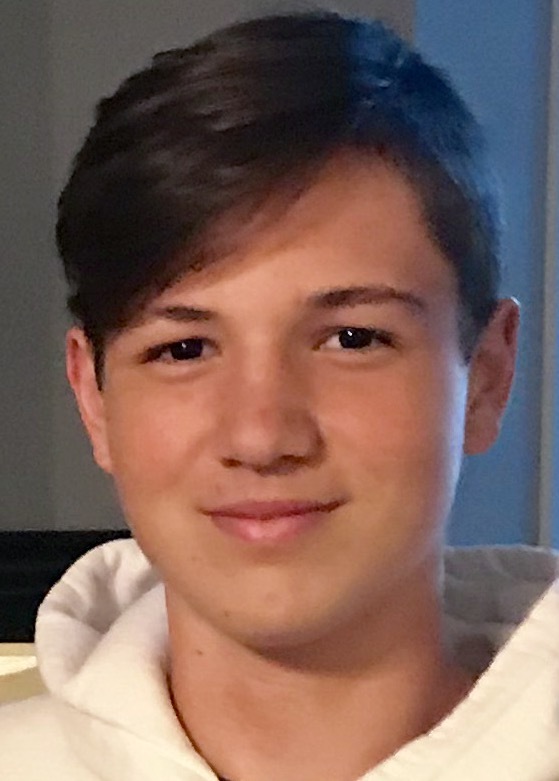 My grandson, Riley, turned 15, yesterday! Those muffins are really mouthwatering...I love your exquisite teacup!! !Gorgeous table!Happy Birthday to the Grands.Hugs to Cissy and you! OOOOOHHHH! I have to try those! Pecan Pie is MY favorite too! Beautiful pics of the grands . .. a handsome pair of young men! Riley must belong to Cissy because they look a lot alike. Handsome boys those grandsons! Pecan pie is my favorite as well so I am sure that I’d enjoy the muffins you and Cissy baked this week. What an elegant tea table! 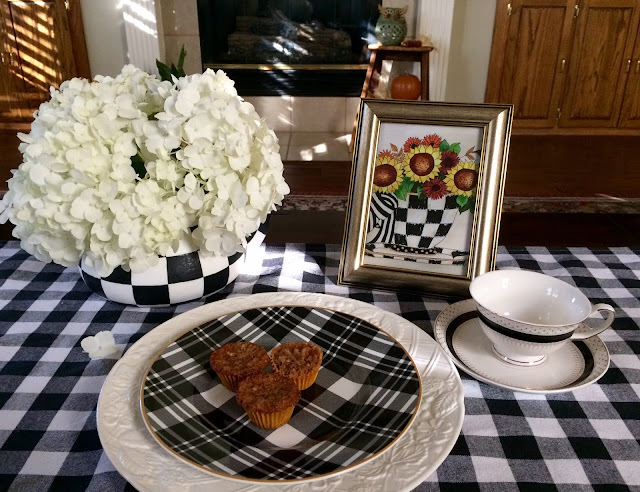 Your black and white plaid tea time is giving serious Mackenzie-Childs vibes. I'm loving your Gracie China teacup because it features my favourite things: black and gold and polka dots. Your tiny pecan muffins are so cute. Also cute are your grandkids. Happy Belated Birthday to the teenage grandsons! 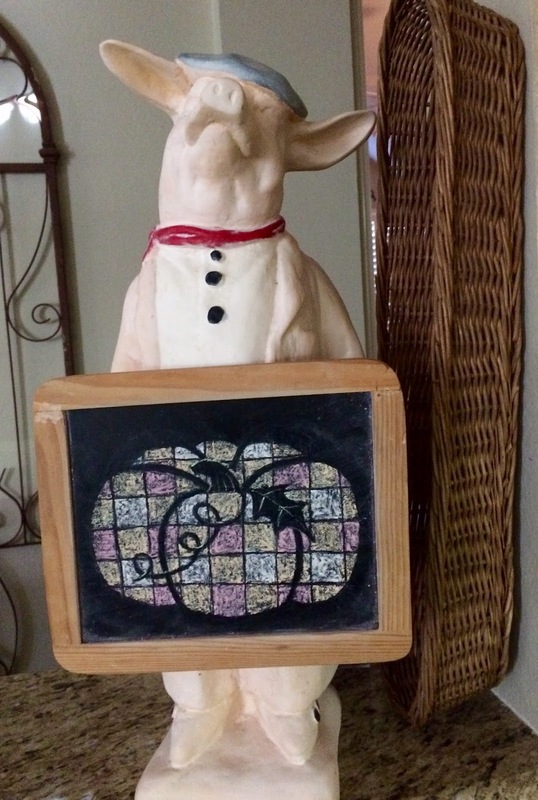 I love that your son paints and is creative. Your grandchildren all look so happy. It’s wonderful that you bake with your granddaughter each week. The muffins look so good and thanks for sharing this recipe at Cooking and Crafting with J&J. Hi Kitty, Hope you are doing well, thinking about you since you returned home. Thoughts and prayers continue. What a lovely table for your tea, so pretty. Yes, Jenna is so talented, I love her art! Such a pretty black and white theme, love the kettle. The mini pecan pies sound delicious and I must make this recipe, we love pecan pie here. I have a recipe for French pecan minis, really good too. I love to make them for Christmas. 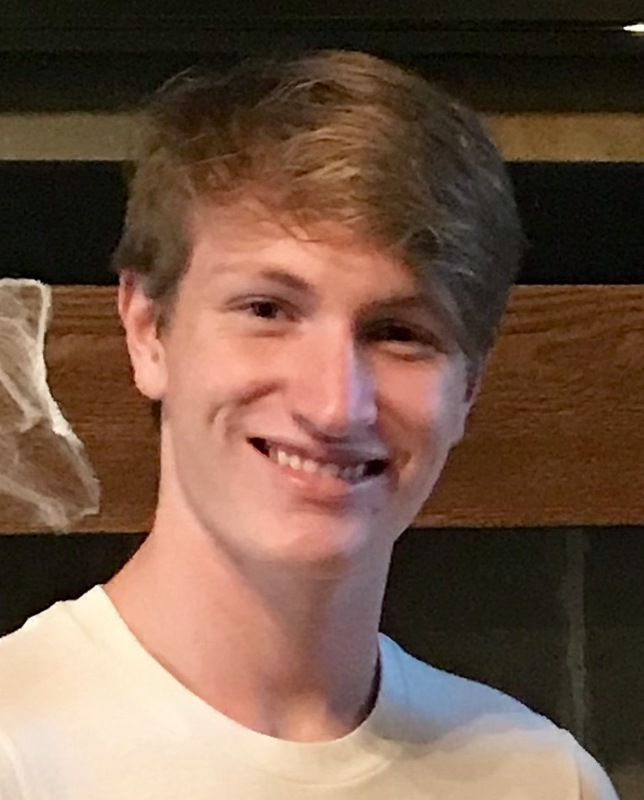 Wow, your grands are so grown up, especially Connor. My Connor is ten now. Tell Cissy she is always such a charming cutie! I just love all of the lovely black & white checks and your beautiful teacup matches so well. The mini pecan muffins look scrumptious...I can almost taste them now! You surely do have some handsome grandsons...Happy Birthday to them again...and enjoy your week, sweet friend! Kitty, I hope this comment sticks. I've had such problems with Blogger lately. Those are such adorable tiny pecan muffins. I think I'd need to eat six, thank you very much!! There are a lot of birthdays this month. Happy Birthday to your handsome grandsons! Those pecan muffins sound so good. I love pecan pie; one of the very few desserts that I like nuts in. The teacup looks very attractive with your pretty checked items. Have a happy day, dear Kitty. Hugs! I'm just loving your black and white theme. The white hydrangeas look so pretty in your checked tea kettle and your china cup is exquisite. Jenna's picture looks so pretty framed and accents your table well. Always enjoyable to see your grands and hear about what they are doing. Happy Birthday to the guys. Your pecan muffins made me nostalgic about my mother-in-law. That recipe was one of her favorites. Oh my goodness Kitty, I was so surprised to see the card I sent you in a frame! Thank you, I am so flattered and delighted you liked it! Whenever I see a pretty teacup I think of you :) Your mini pecan muffins sound so good, you sold me with they taste like pecan pie!! Your grandsons are so handsome and Cissy always grabs my heart... your vignette is so cute, I am a sucker for all things black and white! I bought the coffee mug and a set of plates from that brand at Home Goods just recently too :) So pretty! I love pecans and this little muffins look delicious, Kitty!